There was a lot of volley back and forth with our Favorite School competition this Fall. 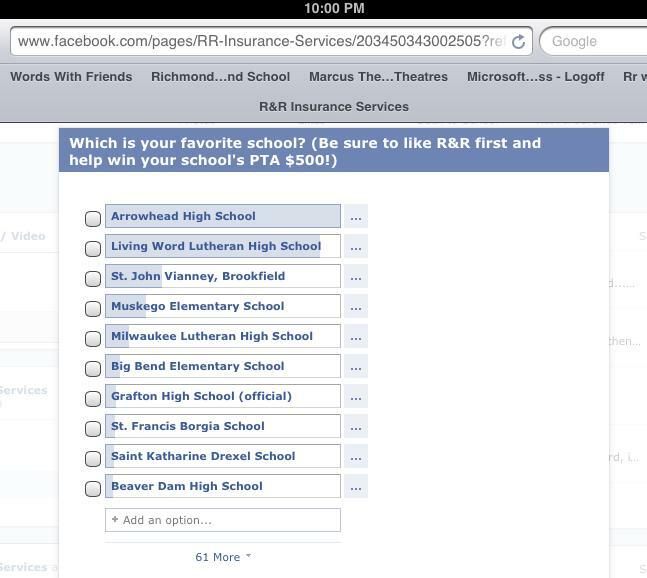 Seventy-one schools were entered into our Facebook poll asking Facebook users to vote for their favorite school on R&R Insurance Services' Facebook page. Living Word Lutheran High School, located in Jackson, WI, had the lead for most of the month-long competition. Arrowhead High School, located in Hartland, WI, and Living Word volleyed back and forth for the lead position during the course of the last days of competition. A total of 1,203 votes in the contest. Early on in the contest we announced that as an added bonus for the winning school, if they were insured commercially with R&R, the prize would be doubled. That added more momentum to the cause. The final tally was captured at 10:00p.m. on Thursday, September 27th, with Arrowhead taking first place with a total vote count of 384. Arrowhead wins a $1,000 donation to their school ($500 doubled because they are insured with R&R Insurance). Living Word Lutheran High School in Jackson, WI was a very close second place winner and receives a donation of $350.00. A huge thank you to all of the schools for making our competition a success. Congratulations to both Arrowhead High School and Living Word Lutheran High School for their achievements!